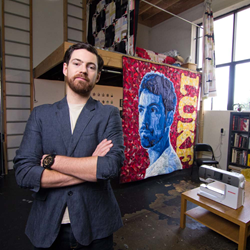 "We are honored to feature these incredible art quilts from such an amazing talent like LUKE Haynes." AccuQuilt has a new exhibit featuring seven quilt designs from the incomparable LUKE Haynes, an architect, quilter, designer who has an uncanny ability to combine different mediums to create conversational art quilts. The Quiltllaborations Exhibit will run in the AccuQuilt Gallery through January 31. Quiltllaborations is a series of collaborative projects that Haynes worked on with other artists and quilters. Haynes did most of the piecing, while artists like Liz Tran and Carlos Jesus Dominguez did the painting elements on a couple of quilts. Quilters Libs Elliott and Heidi Parkes also worked with Haynes on piecing one quilt each. Haynes strives to subvert the traditional quilting form by integrating modern concepts. He received formal training in art and architecture at The Cooper Union in New York. Haynes continues to experiment with quilting art while exploring art and architecture across the globe. He gets inspiration from the pursuit of explaining things that interest him both in terms of concept and material manipulation. A chance encounter with a box of fabric remnants sparked Haynes' imagination, and he's been experimenting with fabric ever since. Haynes developed a system to piece manageable parts into a larger whole, applying a modern design sense to a familiar process. He uses reclaimed materials from the communities he works with in his projects to speak with the textile language of the area. "We are honored to feature these incredible art quilts from such an amazing talent like LUKE Haynes," said AccuQuilt President Greg Gaggini. Haynes loves to create work that asks questions and sparks conversation; therefore, it is fitting that much of Haynes' quilts are featured in museums and galleries across the country. You can view the Quiltllaborations Exhibit online, or you can call 888.258.7913 to schedule a tour to see the exhibit in person. Visit AccuQuilt’s website for the latest information on new product releases.